For the Spanish volleyball player, see Carmen Miranda (volleyball). This name uses Portuguese naming customs. The first or maternal family name is Miranda and the second or paternal family name is Cunha. Carmen Miranda GCIH, OMC (Portuguese pronunciation: [ˈkaɾmẽȷ̃ miˈɾɐ̃dɐ]) (born Maria do Carmo Miranda da Cunha, February 9, 1909 – August 5, 1955), was a Portuguese-born Brazilian samba singer, dancer, Broadway actress, and film star who was popular from the 1930s to the 1950s. Nicknamed "The Brazilian Bombshell", Miranda is noted for her signature fruit hat outfit she wore in her American films. As a young woman, she designed hats in a boutique before making her first recordings with composer Josué de Barros in 1929. Miranda's 1930 recording of "Taí" ("Pra Você Gostar de Mim"), written by Joubert de Carvalho, catapulted her to stardom in Brazil as the foremost interpreter of samba. During the 1930s Miranda performed on Brazilian radio and appeared in five Brazilian chanchadas, films celebrating Brazilian music, dance, and the country's carnival culture. Hello, Hello Brazil! and Hello, Hello, Carnival! embodied the spirit of these early Miranda films. The 1939 musical Banana da Terra (directed by Ruy Costa) gave the world her "Baiana" image, inspired by African-Brazilians from the northeastern state of Bahia. In 1939, Broadway producer Lee Shubert offered Miranda an eight-week contract to perform in The Streets of Paris after seeing her at Cassino da Urca in Rio de Janeiro. The following year she made her first Hollywood film, Down Argentine Way with Don Ameche and Betty Grable, and her exotic clothing and Latin accent became her trademark. That year, she was voted the third-most-popular personality in the United States; she and her group, Bando da Lua, were invited to sing and dance for President Franklin D. Roosevelt. In 1943, Miranda starred in Busby Berkeley's The Gang's All Here, which was noted for its musical numbers with the fruit hats that became her trademark. By 1945, she was the highest-paid woman in the United States. Miranda made 14 Hollywood films between 1940 and 1953. Although she was hailed as a talented performer, her popularity waned by the end of World War II. Miranda came to resent the stereotypical "Brazilian Bombshell" image she had cultivated, and attempted to free herself of it with limited success. She focused on nightclub appearances and became a fixture on television variety shows. Despite being stereotyped, Miranda's performances popularized Brazilian music and increased public awareness of Latin culture. 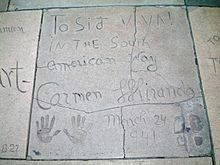 In 1941 she was the first Latin American star to be invited to leave her hand and footprints in the courtyard of Grauman's Chinese Theatre, and was the first South American honored with a star on the Hollywood Walk of Fame. Miranda is considered the precursor of Brazil's 1960s Tropicalismo cultural movement. A museum was built in Rio de Janeiro in her honor, and in 1995 she was the subject of the documentary Carmen Miranda: Bananas is My Business. Miranda was born Maria do Carmo Miranda da Cunha in Várzea da Ovelha e Aliviada, a village in the northern Portuguese municipality of Marco de Canaveses. She was the second daughter of José Maria Pinto da Cunha (17 February 1887 – 21 June 1938) and Maria Emília Miranda (10 March 1886, Rio de Janeiro – 9 November 1971). In 1909, when Miranda was ten months old, her father emigrated to Brazil and settled in Rio de Janeiro, where he opened a barber shop. Her mother followed in 1910 with their daughters, Olinda (1907–1931) and Carmen. Although Carmen never returned to Portugal, she retained her Portuguese nationality. In Brazil, her parents had four more children: Amaro (born 1911), Cecília (1913–2011), Aurora (1915–2005) and Óscar (born 1916). She was christened "Carmen" by her father because of his love for Bizet's operatic masterpiece. This passion for opera influenced his children, and Miranda's love for singing and dancing, at an early age. She was educated at the Convent of Saint Therese of Lisieux. Her father did not approve of Miranda's plans to enter show business; her mother supported her, despite being beaten when her father discovered that his daughter had auditioned for a radio show (she had sung at parties and festivals in Rio). Miranda's older sister, Olinda, developed tuberculosis and was sent to Portugal for treatment; the singer worked in a tie shop at age 14 to help pay her sister's medical bills. She then worked in a boutique (where she learned to make hats), and opened a successful hat business. Miranda was introduced to Josué de Barros, a composer and musician from Bahia, while she was working at her family’s inn. 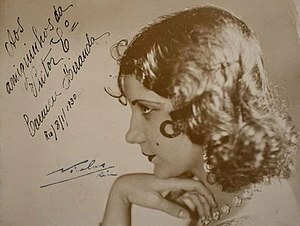 With help from de Barros and Brunswick Records, she recorded her first single (the samba "Não vá Simbora") in 1929. Miranda's second single, "Prá Você Gostar de Mim" (also known as "Taí", and released in 1930), was a collaboration with Brazilian composer Joubert de Carvalho and sold a record 35,000 copies that year. She signed a two-year contract with RCA Victor in 1930, giving them exclusive rights to her image. In 1933 Miranda signed a two-year contract with Rádio Mayrink Veiga, the most popular Brazilian station of the 1930s, and was the first contract singer in Brazilian radio history; for a year, in 1937, she moved to Radio Tupi. She later signed a contract with Odeon Records, making her the highest-paid radio singer in Brazil at the time. Miranda's rise to stardom in Brazil was linked to the growing popularity of a native style of music: the samba. The samba and Miranda's popularity enhanced the revival of Brazilian nationalism during the regime of President Getúlio Vargas. Her gracefulness and vitality in her recordings and live performances gave her the nickname "Cantora do It". The singer was later known as "Ditadora Risonha do Samba", and in 1933 radio announcer Cesar Ladeira christened her "A Pequena Notável". Her Brazilian film career was linked to a genre of musical films which drew on the nation's carnival traditions and the annual celebration and musical style of Rio de Janeiro, Brazil's capital at the time. 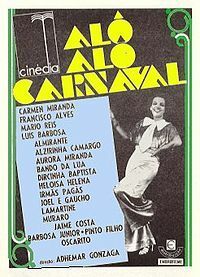 Miranda performed a musical number in O Carnaval Cantado no Rio (1932, the first sound documentary on the subject) and three songs in A Voz do Carnaval (1933), which combined footage of street celebrations in Rio with a fictitious plot providing a pretext for musical numbers. Miranda's next screen performance was in the musical Hello, Hello Brazil! (1935), in which she performed its closing number: the marcha "Primavera no Rio", which she had recorded for Victor in August 1934. Several months after the film's release, according to Cinearte magazine, "Carmen Miranda is currently the most popular figure in Brazilian cinema, judging by the sizeable correspondence that she receives". In her next film, Estudantes (1935), she had a speaking part for the first time. Miranda played Mimi, a young radio singer (who performs two numbers in the film) falls in love with a university student (played by singer Mário Reis). She starred in the next co-production from the Waldow and Cinédia studios, the musical Hello, Hello, Carnival! (1936), which contained a roll call of popular-music and radio performers (including Miranda's sister, Aurora). A standard backstage plot permitted 23 musical numbers and, by contemporary Brazilian standards, the film was a major production. Its set reproduced the interior of Rio's plush Atlântico casino (where some scenes were filmed) and was a backdrop for some of its musical numbers. Miranda's stardom is evident in a film poster with a full-length photograph of her and her name topping the cast list. Although she became synonymous with colorful fruit hats during her later career, she began wearing them only in 1939. Miranda appeared in the film Banana-da-Terra that year in a glamorous version of the traditional dress of a poor black girl in Bahia: a flowing dress and a fruit-hat turban. She sang "Diz Que Tem" which intended to empower a social class which was usually disparaged. Producer Lee Shubert offered Miranda an eight-week contract to perform in The Streets of Paris on Broadway after seeing her perform in 1939 at Rio’s Cassino da Urca. Although she was interested in performing in New York, she refused to accept the deal unless Shubert agreed to also hire her band, the Bando da Lua. He refused, saying that there were many capable musicians in New York who could back her. Miranda remained steadfast, feeling that North American musicians would not be able to authenticate the sounds of Brazil. Shubert compromised, agreeing to hire the six band members but not paying for their transport to New York. President Getúlio Vargas, recognizing the value to Brazil of Miranda's tour, announced that the Brazilian government would pay for the band's transportation on the Moore-McCormack Lines between Rio and New York. Vargas believed that Miranda would foster ties between the northern and southern hemispheres and act as a goodwill ambassador in the United States, increasing Brazil's share of the American coffee market. Miranda took the official sanction of her trip and her duty to represent Brazil to the outside world seriously. She left for New York on the SS Uruguay on May 4, 1939, a few months before World War II. Miranda arrived in New York on 18 May. She and the band had their first Broadway performance on 19 June 1939 in The Streets of Paris. Although Miranda's part was small (she only spoke four words), she received good reviews and became a media sensation. According to New York Times theater critic Brooks Atkinson, most of the musical numbers "ap[e] the tawdry dullness" of genuine Paris revues and "the chorus girls, skin-deep in atmosphere, strike what Broadway thinks a Paris pose ought to be". Atkinson added, however, that "South American contributes the [revue's] most magnetic personality" (Miranda). Singing "rapid-rhythmed songs to the accompaniment of a Brazilian band, she radiates heat that will tax the Broadhurst [theater] air-conditioning plant this Summer". Although Atkinson gave the revue a lukewarm review, he wrote that Miranda made the show. Partly because their unusual melody and heavy accented rhythms are unlike anything ever heard in a Manhattan revue before, partly because there is not a clue to their meaning except the gay rolling of Carmen Miranda's insinuating eyes, these songs, and Miranda herself, are the outstanding hit of the show. When news of Broadway's latest star (known as the Brazilian Bombshell) reached Hollywood, Twentieth Century-Fox began to develop a film featuring Miranda. Its working title was The South American Way (the title of a song she had performed in New York), and the film was later entitled Down Argentine Way (1940). Although its production and cast were based in Los Angeles, Miranda's scenes were filmed in New York because of her club obligations. Fox could combine the footage from both cities because the singer had no dialogue with the other cast members. Down Argentine Way was successful, grossing $2 million that year at the US box office. The Shuberts brought Miranda back to Broadway, teaming her with Olsen and Johnson, Ella Logan, and the Blackburn Twins in the musical revue Sons o' Fun on 1 December 1941. The show was a hodgepodge of slapstick, songs, and skits; according to New York Herald Tribune theater critic Richard Watts, Jr., "In her eccentric and highly personalized fashion, Miss Miranda is by way of being an artist and her numbers give the show its one touch of distinction." On 1 June 1942, she left the production when her Shubert contract expired; meanwhile, she recorded for Decca Records. Miranda was encouraged by the US government as part of Roosevelt's Good Neighbor policy, designed to strengthen ties with Latin America. It was believed that performers like her would give the policy a favorable impression with the American public. Miranda's contract with 20th Century Fox lasted from 1941 to 1946, shortly after the creation (in 1940) of the Office of the Coordinator of Inter-American Affairs. The goal of the OCIAA, based in Rio de Janeiro, was to obtain support from Latin American society and its governments for the United States. The Good Neighbor policy had been linked to US interference in Latin America; Roosevelt sought better diplomatic relations with Brazil and other South American nations, and pledged to refrain from military intervention (which had occurred to protect US business interests in industries such as mining or agriculture). Hollywood was asked to help, and Walt Disney Studios and 20th Century Fox participated. Miranda was considered a goodwill ambassador and a promoter of intercontinental culture. Although Miranda's US popularity continued to increase, she began to lose favor with some Brazilians. On 10 July 1940, she returned to Brazil and was welcomed by cheering fans. Soon after her arrival, however, the Brazilian press began criticizing Miranda for accommodating American commercialism and projecting a negative image of Brazil. Members of the upper class felt that her image was "too black", and she was criticized in a Brazilian newspaper for "singing bad-taste black sambas". Other Brazilians criticized Miranda for playing a stereotypical "Latina bimbo": in her first interview after her arrival in the US In the New York World-Telegram interview, she played up her then-limited knowledge of the English language: "I say money, money, money. I say twenty words in English. I say money, money, money and I say hot dog!" On 15 July, Miranda appeared in a charity concert organized by Brazilian First Lady Darci Vargas and attended by members of Brazil's high society. She greeted the audience in English, and was met with silence. When Miranda began singing "The South American Way", a song from one of her club acts, the audience began to boo her. Although she tried to finish her act, she gave up and left the stage when the audience refused to let up. The incident deeply hurt Miranda, who wept in her dressing room. The following day, the Brazilian press criticized her as "too Americanized". Weeks later, Miranda responded to the criticism with the Portuguese song "Disseram que Voltei Americanizada" ("They Say I've Come Back Americanized"). Another song, "Bananas Is My Business", was based on a line from one of her films and directly addressed her image. Upset by the criticism, Miranda did not return to Brazil for 14 years. Her films were scrutinized by Latin American audiences for characterizing Central and South America in a culturally-homogenous way. When Miranda's films reached Central and South American theaters, they were perceived as depicting Latin American cultures through the lens of American preconceptions. Some Latin Americans felt that their cultures were misrepresented, and felt that someone from their own region was misrepresenting them. Down Argentine Way was criticized, with Argentines saying that it failed to depict Argentine culture. Its lyrics were allegedly replete with non-Argentine themes, and its sets were a fusion of Mexican, Cuban, and Brazilian culture. The film was later banned in Argentina for "wrongfully portraying life in Buenos Aires". Similar sentiments were voiced in Cuba after the debut of Miranda's Weekend in Havana (1941), with Cuban audiences offended by Miranda's portrayal of a Cuban woman. Reviewers noted that an import from Rio could not accurately portray a woman from Havana, and Miranda did not "dance anything Cuban". Her performances were arguably hybrids of Brazilian and other Latin cultures. Critics said that Miranda's other films misrepresented Latin locales, assuming that Brazilian culture was a representation of Latin America. During the war years, Miranda starred in eight of her 14 films; although the studios called her the Brazilian Bombshell, the films blurred her Brazilian identity in favor of a Latin American image. According to a Variety review of director Irving Cummings' That Night in Rio (1941, Miranda’s second Hollywood film), her character upstaged the leads: "[Don] Ameche is very capable in a dual role, and Miss [Alice] Faye is eye-appealing but it’s the tempestuous Miranda who really gets away to a flying start from the first sequence". A New York Times article said, "Whenever one or the other Ameche character gets out of the way and lets [Miranda] have the screen, the film sizzles and scorches wickedly." Years later, Clive Hirschhorn wrote: "'That Night in Rio' was the quintessential Fox war-time musical – an over-blown, over-dressed, over-produced and thoroughly irresistible cornucopia of escapist ingredients." On 24 March 1941, Miranda was one of the first Latinas to imprint her hand- and footprints on the sidewalk of Grauman's Chinese Theatre. Her next film, Week-End in Havana, was directed by Walter Lang and produced by William LeBaron. The cast included Alice Faye, John Payne, and Cesar Romero. After the studio's third effort to activate the "Latin hot blood", Fox was called "Hollywood's best good neighbor" by Bosley Crowther. During the week it was released, the film topped the box office (surpassing Citizen Kane, released a week earlier). In 1942 20th Century-Fox paid $60,000 to Lee Shubert to terminate his contract with Miranda, who finished her Sons o' Fun tour and began filming Springtime in the Rockies. The film, which grossed about $2 million, was one of the year's ten most-successful films at the box office. According to a Chicago Tribune review, it was "senseless, but eye intriguing ... The basic plot is splashed over with songs and dances and the mouthings and eye and hand work of Carmen Miranda, who sure would be up a tree if she ever had to sing in the dark". In 1941 Miranda was invited to leave her hand and (high-heeled) footprints at Grauman's Chinese Theatre, the first Latin American to do so. In 1943, she appeared in Busby Berkeley's The Gang's All Here. Berkeley's musicals were known for lavish production, and Miranda's role as Dorita featured "The Lady in the Tutti-Frutti Hat". A special effect made her fruit-bedecked hat appear larger than possible. By then she was typecast as an exotic songstress, and under her studio contract she was obligated to make public appearances in her ever-more-outlandish film costumes. One of her records, "I Make My Money With Bananas" seemed to pay ironic tribute to her typecasting. The Gang's All Here was one of 1943's 10 highest-grossing films and Fox's most expensive production of the year. It received positive reviews, although the New York Times film critic wrote: "Mr. Berkeley has some sly notions under his busby. One or two of his dance spectacles seem to stem straight from Freud." The following year Miranda made a cameo appearance in Four Jills in a Jeep, a film based on a true adventure of actresses Kay Francis, Carole Landis, Martha Raye, and Mitzi Mayfair; Alice Faye and Betty Grable also made brief appearances. In 1944 Miranda also starred with Don Ameche in Greenwich Village, a Fox musical with William Bendix and Vivian Blaine in supporting roles. 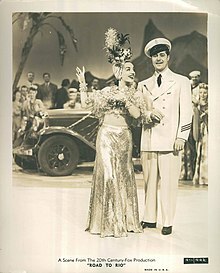 The film was poorly received; according to the New York Times, "Technicolor is the picture's chief asset, but still worth a look for the presence of Carmen Miranda". In her Miami News review, Peggy Simmonds wrote: "Fortunately for Greenwich Village, the picture is made in Technicolor and has Carmen Miranda. Unfortunately for Carmen Miranda, the production doesn't do her justice, the overall effect is disappointing, but still she sparkles the picture whenever she appears." Greenwich Village was less successful at the box office than Fox and Miranda had expected. Miranda's third 1944 film was Something for the Boys, a musical comedy based on the Broadway musical with songs by Cole Porter and starring Ethel Merman. It was Miranda's first film without William LeBaron or Darryl F. Zanuck as producer. The producer was Irving Starr, who oversaw the studio's second-string films. According to Time magazine, the film "turns out to have nothing very notable for anyone". By 1945 Miranda was Hollywood's highest-paid entertainer and the top woman taxpayer in the United States, earning more than $200,000 that year ($2.2 million in 2010, adjusted for inflation). After World War II, Miranda's films at Fox were produced in black-and-white, indicative of Hollywood's diminishing interest in her and Latin Americans in general. A monochrome Carmen Miranda reduced the box-office appeal of the backstage musical, Doll Face (1945), in which she was fourth on the bill. Miranda played Chita Chula, billed in the show-within-the-film as "the little lady from Brazil"—a cheerful comic sidekick to leading lady Doll Face (Vivian Blaine) with one musical number and little dialogue. 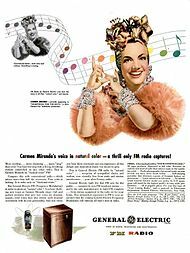 A New York Herald Tribune review read, "Carmen Miranda does what she always does, only not well"; according to The Sydney Morning Herald, "Carmen Miranda appears in a straight part with only one singing number. The innovation is not a success, but the fault is the director's not Carmen's." In If I'm Lucky (1946), her follow-up film for Fox when she was no longer under contract, Miranda was again fourth on the bill with her stock screen persona firmly in evidence: heavily-accented English, comic malapropisms, and bizarre hairstyles recreating her famous turbans. When Miranda's contract with Fox expired on January 1, 1946, she decided to pursue an acting career free of studio constraints. Miranda's ambition was to play a lead role showcasing her comic skills, which she set out to do in Copacabana (1947, an independent production released by United Artists starring Groucho Marx). Although her films were modest hits, critics and the American public did not accept her new image. Although Miranda's film career was faltering, her musical career remained solid and she was still a popular nightclub attraction. From 1948 to 1950, she joined the Andrews Sisters in producing and recording three Decca singles. Their first collaboration was on radio in 1945, when Miranda appeared on ABC's The Andrews Sisters Show. Their first single, "Cuanto La Gusta", was the most popular and reached number twelve on the Billboard chart. "The Wedding Samba", which reached number 23, followed in 1950. After Copacabana, Joe Pasternak invited Miranda to make two Technicolor musicals for Metro-Goldwyn-Mayer: A Date with Judy (1948) and Nancy Goes to Rio (1950). In the first production MGM wanted to portray a different image, allowing her to remove her turban and reveal her own hair (styled by Sydney Guilaroff) and makeup (by Jack Dawn). Miranda's wardrobe for the film substituted elegant dresses and hats designed by Helen Rose for "baiana" outfits. She was again fourth on the bill as Rosita Cochellas, a rumba teacher who first appears about 40 minutes into the film and has little dialogue. Despite MGM's efforts to change Miranda's persona, her roles in both productions were peripheral, watered-down caricatures relying on fractured English and over-the-top musical and dance numbers. In her final film, Scared Stiff (1953, a black-and-white Paramount production with Dean Martin and Jerry Lewis), Miranda's appeal was again muted. Returning full-circle to her first Hollywood film, Down Argentine Way, she had virtually no narrative function. Lewis parodies her, miming badly to "Mamãe Eu Quero" (which is playing on a scratched record) and eating a banana he plucks from his turban. Miranda played Carmelita Castilha, a Brazilian showgirl on a cruise ship, with her costumes and performances bordering on self-parody. In April 1953, she began a four-month European tour. While performing in Cincinnati in October, Miranda collapsed from exhaustion; she was rushed to LeRoy Sanitarium by her husband, Dave Sebastian, and canceled four following performances. Miranda became depressed and underwent electroshock therapy; when that failed to cure her, her physician suggested a return visit to Brazil. According to Bananas Is My Business, Miranda's family blamed her troubled, abusive marriage for her nervous breakdown which forced her to return to Rio de Janeiro for four months to recuperate. She returned to the US on 4 April 1955. Desiring creative freedom, Miranda decided to produce her own film in 1947 and played opposite Groucho Marx in Copacabana. The film's budget was divided into about ten investors' shares. A Texan investor who owned one of the shares sent his brother, David Sebastian (23 November 1907 – 11 September 1990), to keep an eye on Miranda and his interests on the set. Sebastian befriended her, and they began dating. Miranda and Sebastian married on 17 March 1947 at the Church of the Good Shepherd in Beverly Hills, with Patrick J. Concannon officiating. In 1948 Miranda became pregnant, but miscarried after a show. Although the marriage was brief, Miranda (who was Catholic) did not want a divorce. Her sister, Aurora, said in the documentary Bananas is My Business: "He married her for selfish reasons; she got very sick after she married and lived with a lot of depression". The couple announced their separation in September 1949, but reconciled several months later. Miranda was discreet, and little is known about her private life. Before she left for the US, she had relationships with Mario Cunha, Carlos da Rocha Faria (son of a traditional family in Rio de Janeiro) and Aloysio de Oliveira, a member of the Bando da Lua. In the US, Miranda maintained relationships with John Payne, Arturo de Córdova, Dana Andrews, Harold Young, John Wayne, Donald Buka and Carlos Niemeyer. During her later years, in addition to heavy smoking and alcohol consumption, she began taking amphetamines and barbiturates which took a toll on her health. Miranda performed at the New Frontier Hotel in Las Vegas in April 1955, and in Cuba three months later before returning to Los Angeles to recuperate from a recurrent bronchial ailment. On 4 August, she was filming a segment for the NBC variety series The Jimmy Durante Show. According to Durante, Miranda had complained of feeling unwell before filming; he offered to find her a replacement, but she declined. After completing "Jackson, Miranda, and Gomez", a song-and-dance number with Durante, she fell to one knee. Durante later said, "I thought she had slipped. She got up and said she was outa [sic] breath. I told her I'll take her lines. But she goes ahead with 'em. We finished work about 11 o'clock and she seemed happy." After the last take, Miranda and Durante gave an impromptu performance on the set for the cast and technicians. The singer took several cast members and some friends home with her for a small party. She went upstairs to bed at about 3 a.m. Miranda undressed, placed her platform shoes in a corner, lit a cigarette, placed it in an ashtray and went into her bathroom to remove her makeup. She apparently came from the bathroom with a small, round mirror in her hand; in the small hall which led to her bedroom, she collapsed with a fatal heart attack. Miranda was 46 years old. Her body was found at about 10:30 a.m. lying in the hallway. The Jimmy Durante Show episode in which Miranda appeared was aired two months after her death, on 15 October 1955, and a clip of the episode was included in the A&E Network's Biography episode about the singer. In accordance with her wishes, Miranda's body was flown back to Rio de Janeiro; the Brazilian government declared a period of national mourning. 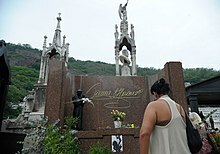 About 60,000 people attended her memorial service at the Rio town hall, and more than half a million Brazilians escorted her funeral cortège to the cemetery. Miranda is buried in São João Batista Cemetery in Rio de Janeiro. In 1956 her belongings were donated by her husband and family to the Carmen Miranda Museum, which opened in Rio on 5 August 1976. For her contributions to the entertainment industry, Miranda has a star on the Hollywood Walk of Fame at the south side of the 6262 block of Hollywood Boulevard. Miranda's Hollywood image was that of a generic Latina, blurring distinctions between Brazil, Portugal, Argentina, and Mexico and samba, tango and habanera music. It was stylized and flamboyant; she often wore platform sandals and towering headdresses made of fruit, becoming known as "the lady in the tutti-frutti hat". Her enormous, fruit-laden hats were iconic visuals recognized worldwide; Saks Fifth Avenue developed a line of Miranda-inspired turbans and jewelry in 1939, and Bonwit Teller created mannequins resembling the singer. Her tutti-frutti hat from The Gang's All Here (1943) inspired the United Fruit Company's Chiquita Banana logo the following year. During the 1960s, tropicália filmmakers in Brazil were influenced by Miranda's Hollywood films. In 2009 she was the subject of São Paulo Fashion Week and a short film, Tutti Frutti, by German photographer Ellen von Unwerth. Two years later, Macy's wanted to use Miranda to promote a clothing line. Other products influenced by her stardom are the Brazilian fashion brand Malwee's "Chica Boom Chic" collection for women, and the Chica Boom Brasil company's high-end Carmen Miranda line, which includes Miranda-themed bags, wall clocks, crockery and placemats. The Museu da Imagem e do Som do Rio de Janeiro (Rio de Janeiro Museum of Image and Sound) on Copacabana Beach in June 2014. The building will house the Carmen Miranda Museum collection. Miranda's dresses and photos exhibited at the Museum in Rio de Janeiro. Brazilian musician Caetano Veloso wrote about Miranda's legacy in a New York Times essay, "For generations of musicians who were adolescents in the second half of the 1950s and became adults at the height of the Brazilian military dictatorship and the international wave of counterculture - my generation - Carmen Miranda was first a cause of both pride and shame, and later, a symbol that inspired the merciless gaze we began to cast upon ourselves; Carmen conquered 'white' America as no other South American has done or ever would, in an era when it was enough to be 'recognizable Latin and Negroid' in style and aesthetics to attract attention." For Veloso and other musicians contemplating a career abroad, Miranda's pioneering experiences continue to loom as a point of reference. Miranda helped establish and transform the relationship between Brazilian musicians and American producers that now has created several remarkable transnational collaborations ... To think of her is to think about the complexity of this relationship". Although she was more popular abroad than in Brazil at her death, Miranda contributed to Brazilian music and culture. She was accused of commercializing Brazilian music and dance, but Miranda can be credited with bringing its national music (the samba) to a global audience. She introduced the baiana, with wide skirts and turbans, as a Brazilian showgirl at home and abroad. The baiana became a central feature of Carnival for women and men. Since her death, Miranda is remembered as an important Brazilian artist and one of the most influential in Hollywood. She was one of 500 stars nominated for the American Film Institute's 50 greatest screen legends. On 25 September 1998, a square in Hollywood was named Carmen Miranda Square in a ceremony headed by honorary mayor of Hollywood Johnny Grant (one of Miranda's friends since World War II) and attended by Brazilian consul general Jorió Gama and the Bando da Lua. The square is located at the intersection of Hollywood Boulevard and Orange Drive, across from Grauman's Chinese Theatre, near where Miranda gave an impromptu performance on V-J Day. To commemorate the 50th anniversary of Miranda's death, a Carmen Miranda Forever exhibit was displayed at the Museum of Modern Art in Rio de Janeiro in November 2005 and at the Latin America Memorial in São Paulo the following year. In 2005, Ruy Castro published a 600-page biography of "the most famous Brazilian woman of the 20th century." Brazilians "tend to forget," Castro told Mac Margolis of Newsweek, that "no Brazilian woman has ever been as popular as Carmen Miranda – in Brazil or anywhere." Dorival Caymmi's "O que é que a baiana tem?" was his first work to be recorded, and introduced to the US the samba rhythm and Miranda in 1939; it was a Latin category inductee of the 2008 National Recording registry list. Miranda, Selena, Celia Cruz, Carlos Gardel and Tito Puente appeared on a set of commemorative US Postal Service Latin Music Legends stamps, painted by Rafael Lopez, in 2011. Marie Therese Dominguez, vice president of government relations and public policy for the postal service, said: "From this day forward, these colorful, vibrant images of our Latin music legends will travel on letters and packages to every single household in America. In this small way, we have created a lasting tribute to five extraordinary performers, and we are proud and honored to share their legacy with Americans everywhere through these beautiful stamps". Down Argentine Way and The Gang's All Here were inductees of the 2014 National Film Registry list. The 2016 Summer Olympics closing ceremony included a tribute to Miranda before the athletes' parade, with Roberta Sá portraying the singer. On 9 February 2017, Miranda was the subject of a Google Doodle created by Google artist Sophie Diao commemorating the 108th anniversary of her birth. In Jimmy Buffett's album "A White Sport Coat and a Pink Crustacean" (1973) "They Don't Dance Like Carmen No More". 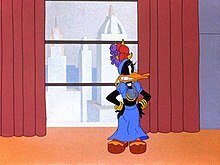 In The House Across the Bay (1940, produced by Walter Wanger and released by United Artists), Joan Bennett performed the Mirandaesque "Chula Chihuahua." Babes on Broadway's (1941) finale opens with "Bombshell from Brazil", where Mickey Rooney (dressed as Miranda) sings "Mamãe Eu Quero". 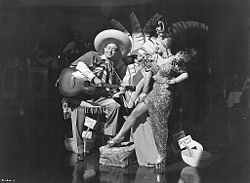 The finale of Time Out for Rhythm (1941) begins with the Three Stooges performing a rumba number; Curly Howard is dressed as Carmen Miranda. The United Fruit Company created a banana-woman character in 1944, Chiquita, whose fruit hat resembled Miranda's. In Small Town Deb (1942), Jane Withers does an impression of Carmen Miranda and sings "I, Yi, Yi, Yi, Yi (I Like You Very Much)," which was one of Miranda's signature songs. In the British comedy, Fiddlers Three, Tommy Trinder gives a bizarre performance as "Senorita Alvarez" from Brazil, a bold impersonation of Miranda. In Winged Victory (1944) Sascha Brastoff impersonates Carmen Miranda. In Mildred Pierce, Jo Ann Marlowe sings a Mirandaesque South American Way. In "Be a Pal", a season-one episode of I Love Lucy, Lucille Ball imitates Miranda and lip-syncs to "Mamãe Eu Quero". In 1976, musician Leslie Fish wrote and recorded a song called "Carmen Miranda's Ghost," on her album Folk Songs for Folk Who Ain't Even Been Yet. The song describes the chaos that ensues when the singer's ghost appears on a space station. It was later the basis for a multi-author short story anthology edited by Don Sakers. John Cale's 1989 Words for the Dying features a song co-written with Brian Eno titled "The Soul of Carmen Miranda." 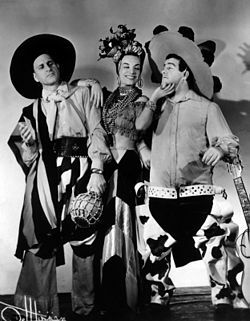 In Diplomatic Courier (1952), during a nightclub sequence, Arthur Blake performs impersonations of Carmen Miranda, Franklin Delano Roosevelt and Bette Davis. Caetano Veloso appeared dressed as Miranda in January 1972, in his first show after his return to Brazil from London. Helena Solberg filmed a documentary, Carmen Miranda: Bananas is My Business, in 1995. Eduardo Dusek recorded a cover version of the song "Tá-Hi (Pra Você Gostar de Mim)", written by Joubert de Carvalho and recorded by Miranda in 1930, for the 2003 telenovela Chocolate com Pimenta. In 2004, Caetano Veloso and David Byrne performed live at Carnegie Hall a song they had written together, "Dreamworld: Marco de Canaveses", that pays homage to Miranda. In 2007, BBC Four produced Carmen Miranda – Beneath the Tutti Frutti Hat, a one-hour documentary which included interviews with biographer Ruy Castro, niece Carminha and Mickey Rooney. That year, singer Ivete Sangalo recorded a cover version of the song "Chica Chica Boom Chic" for the DVD MTV ao Vivo. For Miranda's centenary, Daniela Mercury recorded a "duet" with the singer on a cover of "O Que É Que A Baiana Tem? ", which includes the original 1939 recording. The romantic fantasy film The Shape of Water (2017) features Miranda’s hit song “Chica Chica Boom Chic”. Bonita Flamingo, a character in the children's show Noddy, is a flamingo spoof of Miranda. "Em Tudo, Menos em Ti"
"Cuidado Com a Gaita do Ary"
"A Pensão Da Dona Stella"
"A Nossa Vida Hoje É Diferente"
"Disso É Que Eu Gosto"
"O Dengo Que a Nêga Tem"
"É Um Quê Que a Gente Tem"
"The Man With the Lollipop Song"
"Não Te Dou A Chupeta"
"O Passo Do Kanguru (Brazilly Willy)"
^ "Raul Seixas e Carmen Miranda ganham Ordem do Mérito Cultural". O Estado de S. Paulo. 24 November 2009. Retrieved 9 June 2015. ^ Dennison & Shaw 2004, p. 112. ^ Rohter, Larry (13 December 2001). "The Real Carmen Miranda Under the Crown of Fruit". The New York Times. Retrieved 3 January 2014. ^ Gloria Helena Rey (1 March 1985). "Brazil remembers its fruit-topped lady". Evening Independent. Retrieved 11 April 2014. ^ Andrew S. Vargas. Stereotype or Samba Pioneer? A Look Back at the Controversial Legacy of Carmen Miranda. ^ Amanda J Ellis. Captivating a country with her curves: Examining the importance of Carmen Miranda's iconography in creating national identities. ^ Bloom, Stephen G. (24 August 1984). "After 30 years, Carmen Miranda still a bombshell". Edmonton Journal. p. B5. Retrieved 21 November 2012. ^ Woodene Merriman (30 May 1988). "On Trail Of Miranda Museum". Pittsburgh Post-Gazette. Retrieved 15 April 2014. ^ 14 April 2014 (17 June 1946). "Movie Stars And Detroit Auto Men Get Highest Pay". Tampa Bay Times. ^ "Biography – Carmen Miranda". Jason Ankeny. p. AllMusic. ^ DK Eyewitness Travel Guide: Brazil. 9 June 2014. ^ "Carmen Miranda – Tropicália". Ana de Oliveira. p. http://tropicalia.com.br/. Retrieved 13 January 2014. ^ David Beard (29 January 1986). "Museum Shows Off The Fruits Of Carmen Miranda". Chicago Tribune. Retrieved 15 March 2014. ^ Thomas, Kevin (7 October 1995). "TV Reviews: 'Carmen Miranda' Looks Behind Image". The Los Angeles Times. Retrieved 15 March 2014. ^ Leonardo Ladeira (2 July 2010). 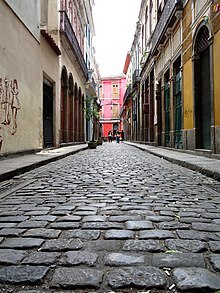 "Travessa do Comércio - Um passeio pelo Rio Colonial" (in Portuguese). Archived from the original on 3 February 2015. Retrieved 3 February 2015. ^ McGowan & Pessanha 1997, p. 32. ^ a b Tompkins & Foster 2001, p. 192. ^ a b c "The century of the Brazilian Bombshell". It's time for Brazil in Singapore. Singapore: Sun Media: 63. ^ Luis Fernando Vianna (15 February 2007). "Ruy Castro mostra que Carmen Miranda foi além das marchinhas". Folha de S.Paulo. Retrieved 23 May 2014. ^ "50 (more) Years Of Carmen Miranda". 9 February 2006. p. Connect Brazil. Archived from the original on 11 July 2013. Retrieved 19 May 2014. ^ Ellis, Amanda J.. State University of New York at Buffalo, ProQuest Dissertations Publishing, 2008. 1453469. ^ Alessander Kerber (February 2006). "Carmen Miranda entre representações da identidade nacional e de identidades regionais". Revista Acadêmico. Archived from the original on 15 July 2014. Retrieved 23 May 2014. ^ Bayman, Louis; Pinazza, Natália (2013). Directory of World Cinema: Brazil. Intellect Books. p. 15. ISBN 978-1-78320-009-2. ^ McCann, Bryan (13 April 2004). Hello, Hello Brazil: Popular Music in the Making of Modern Brazil. Duke University Press. ISBN 0-8223-8563-5. ^ "Directory of World Cinema: Brazil". Louis Bayman, Natália Pinazza. Retrieved 26 February 2016. ^ film, Carmen Miranda: Bananas Is My Business (Brazil, 1995). Directed by Helena Solberg. ^ "MIRANDA'S LEGACY STILL BEARS FRUIT OF CONTROVERSY 40 YEARS AFTER DEATH". Deseret News. Reuter News Service. 6 August 1995. Retrieved 17 December 2013. ^ "Biography of Carmen Miranda". Uol (in Portuguese). Retrieved 26 November 2015. ^ "Morte de Carmen Miranda completa 50 anos nesta sexta". Terra Networks (in Portuguese). 5 August 2005. ^ From Tejano to Tango: Essays on Latin American Popular Music (in Portuguese). 5 August 2005. p. Walter Aaron Clark. ^ Vinson, Bill; Casey, Ginger Quering. "S.S. Uruguay". Welcome Aboard Moore-McCormack Lines. Retrieved 20 May 2013. ^ Atkinson, Brooks (20 June 1939). "The Streets of Paris Moves to Broadway" (PDF). The New York Times. Retrieved 14 June 2013. ^ Ruíz & Korrol 2005, p. 199. ^ Alberto Sandoval-Sánchez. José, Can You See? : Latinos on and Off Broadway. ^ "Relato da estréia de Carmen Miranda em Nova York é de arrepiar; leia". Folha de S.Paulo. 6 March 2009. Retrieved 20 December 2013. ^ Kirsten Pullen. "Like a Natural Woman: Spectacular Female Performance in Classical Hollywood". ^ Castro 2005, p. 210. ^ Martha Gil Montero. "Brazilian Bombshell: The Biography of Carmen Miranda". ^ "Broadway Likes Miranda's Piquant Portuguese Songs". LIFE. 17 July 1939. ^ Liz Sonneborn. A to Z of American Women in the Performing Arts. ^ Peter Lev. Twentieth Century-Fox: The Zanuck-Skouras Years, 1935–1965. ^ GLORIA HELENA REY (1 September 1985). "5-Foot, 1-Inch Performer Died in 1955: Brazil Pays Homage to Carmen Miranda". Los Angeles Times. ^ Lev, Peter. Twentieth Century-Fox: The Zanuck-Skouras Years, 1935–1965. p. 90. Retrieved 28 February 2015. ^ John Storm Roberts. The Latin Tinge: The Impact of Latin American Music on the United States. ^ a b Parish & Pitts 2003. ^ Nicole Akoukou Thompson (9 January 2014). ""The Brazilian Bombshell" Carmen Miranda & Her Life with and without the Fruit Hat". Latin Post. ^ Fundação Getúlio Vargas. "Anos de Incerteza (1930–1937) a Política de boa vizinhança". ^ Marcio Siwi. "U.S.–Brazil Cultural Relations during World War II" (PDF). ^ a b Ruíz & Korrol 2005, p. 200. ^ Amanda Ellis, "Captivating a Country With Her Curves: Examining the Importance of Carmen Miranda's Iconography in Creating National Identities" (Masters Thesis, State University of New York at Buffalo, 2008), 31–33. ^ Shari Roberts. "The Lady in the Tutti-Frutti Hat: Carmen Miranda, a Spectacle of Ethnicity", Cinema Journal 32, no. 3 (1993): 6. ^ Frank D. McCann. "Brazil and World War II: The Forgotten Ally. What did you do in the war, Zé Carioca?". University of New Hampshire. ^ "Review: 'That Night in Rio'". 31 December 1940. p. Variety. Retrieved 10 March 2014. ^ Bosley Crowther (10 March 1941). "'That Night in Rio,' a Colorful Musical, With Alice Faye, Carmen Miranda and Don Ameche, Opens at the Roxy -- 'The Mad Emperor' at the 55th St". The New York Times. ^ Hirschhorn 1981, p. 186. ^ Bosley Crowther (8 November 1941). "'Week-End in Havana,' a Colorful and Lively Visit to Another Cinematic Hot Spot, at the Roxy". New York Times. ^ "Latinos and American Popular Culture". Patricia M. Montilla. ^ "Carmen Miranda and Cultural Exchange. In the Era of the New State and the Good Neighbor" (PDF). Alicia Outing. p. Barnard College. ^ "Twentieth Century-Fox: A Corporate and Financial History". Aubrey Solomon. p. 61. Retrieved 9 September 2014. ^ Mae Tinée, “All the Usual Ingredients in Musical Film”, Chicago Daily Tribune, 11 December 1942, p. 30. ^ "Yes, nós temos bananas: histórias e receitas com biomassa de banana verde". Heloisa de Freitas Valle & Marcia. Retrieved 11 September 2014. ^ "The Gang s All Here (1943) At the Roxy". New York Times. 23 December 1943. ^ "Greenwich Village (1944)' Greenwich Village,' With Carmen Miranda, Comes to Roxy -- Film From Paris at the 55th St". p. The New York Times. Retrieved 7 March 2014. ^ "Color and Carmen Abound In Film About Greenwich Village; Review". Peggy Simmonds. 8 September 1944. p. The Miami News. Retrieved 15 June 2015. ^ "Cinema, Also Showing Dec. 11, 1944". 11 December 1944. p. Time. Retrieved 23 August 2017. ^ "Large Earnings By Films Stars". The Age. 17 June 1946. p. 3. Retrieved 21 November 2012. ^ Tompkins & Foster 2001, p. 195. ^ "NEW FILMS REVIEWED "Doll Face" The Sydney Morning Herald". 8 July 1946. ^ a b Parish & Pitts 2003, pp. 607–608. ^ Castro 2005, pp. 418–19. ^ Parish & Pitts 2003, p. 608. ^ Sforza 2000, p. 289. ^ "Godfrey Rival May Hire Someone Just To Fire". Earl Wilson. 6 November 1953. p. Sarasota Herald-Tribune. ^ a b Sarasota Herald-Tribune (18 March 1947). 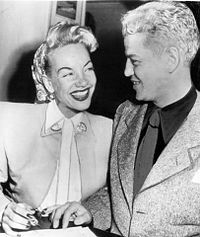 Dancer Carmen Miranda Wed To Movie Producer. ^ Ruíz & Korrol 2005, p. 206. ^ "Carmen Miranda Set For Trial Separation". Toledo Blade. 27 September 1949. p. 3. Retrieved 21 November 2012. ^ Group, Global Media (7 February 2009). "Gente - Carmen Miranda". ^ Brioux 2008, p. 176. ^ "Actress Dies After Making Video Film". Pittsburgh Post-Gazette. 6 August 1955. Retrieved 4 April 2014. ^ "Hollywood Mourns 2 Actresses: Suzan Ball, Carmen Miranda, 41". The Free Lance–Star. 6 August 1955. Retrieved 25 March 2014. ^ "From the Archives: Film Star Carmen Miranda Dies". Los Angeles Times. 6 August 1955. Retrieved 15 July 2016. ^ Bakish 2007, p. 136. ^ "Death Takes Carmen Miranda, Suzan Ball". Reading Eagle. 6 August 1955. Retrieved 17 December 2013. ^ "Death Takes Suzan Ball, Carmen Miranda Friday". Ludington Daily News. 6 August 1955. Retrieved 17 December 2013. ^ Ruíz & Korrol 2005, p. 207. ^ Ruíz & Korrol 2005, p. 193. ^ Astor, Michael (1 December 2005). "In Rio, Carmen Miranda's Still Hard to Top". The Washington Post. ^ Lawrence, Sandra (12 August 2003). "Brazil: In search of the queen of samba". London: telegraph.co.uk. Retrieved 30 October 2008. ^ "Walk of Fame – Carmen Miranda". p. walkoffame.com. 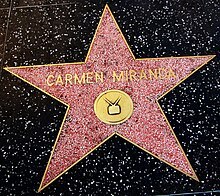 ^ "Hollywood Star Walk – Carmen Miranda". Los Angeles Times. ^ Tompkins & Foster 2001, p. 191. ^ Lisa Shaw (5 August 2015). "Carmen Miranda's fashion: Turbans, platform shoes and a lot of controversy". The Guardian. ^ "G1 > Pop & Arte - NOTÍCIAS - São Paulo Fashion Week terá trio de musas da moda e Carmen Miranda". ^ "Carmen Miranda, a pequena notável - Miss Owl". 28 February 2014. ^ Cristina Tardáguila. "Família de Carmen Miranda profissionaliza gestão da marca". O Globo. ^ "Chica Boom Chic - Música de Carmen Miranda dá nome à coleção Malwee". ^ Darien J. Davis. To Be or Not to Br Brazilian? Carmen Miranda's Quest for Fame and "Authenticity" in the United States. ^ Teresa A. Meade (27 March 2011). A Brief History of Brazil. ^ "A compendium of the 500 stars nominated for top 50 "Greatest Screen Legends" status" (PDF). American Film Institute. ^ Tobar, Hector; Trevino, Joseph (26 September 1998). "Some City Squares Bring Lives, and History, Full Circle". Los Angeles Times. Retrieved 21 November 2012. ^ "Intersection honors Carmen Miranda". Sarasota Herald-Tribune. 28 September 1998. Retrieved 21 November 2012. ^ "Exposição 'Carmen Miranda para sempre' é prorrogada". O Globo. 6 April 2006. Retrieved 30 March 2017. ^ Chu, Henry (25 December 2005). "Let's get ready to rumba". Los Angeles Times. ^ "Mega exposição sobre Carmem Miranda estréia no MAM do Rio". Oba Oba. 2005. ^ "Icon: We Still Have Bananas". Newsweek. 22 January 2006. ^ "The Sounds of American Life and Legend Are Tapped for the Seventh Annual National Recording Registry". Library of Congress. 9 June 2009. ^ "Latin Music Legends". US Postal Service. 16 March 2011. ^ "Selena, Tito Puente, Celia Cruz To Appear on U.S. Postage Stamps". Billboard. 9 March 2011. ^ "'Big Lebowski', 'Willy Wonka' Among National Film Registry's 25 Selections". Variety. 18 December 2014. ^ "Brazil Passes the Olympic Torch, Proud and Relieved". The Wall Street Journal. 22 August 2016. ^ "Carmen Miranda is celebrated with a Google doodle – in pictures". The Guardian. 14 February 2017. ^ Jeff Stafford. THE HOUSE ACROSS THE BAY. ^ McGowan & Pessanha 1997. ^ Jean-Louis Ginibre; John Lithgow; Barbara Cady. Ladies Or Gentlemen: A Pictorial History of Male Cross-dressing in the Movies. ^ Steve Striffler, Mark Moberg. Banana Wars: Power, Production, and History in the Americas. ^ Small Town Deb. Catalog - American Film Institute. Retrieved 22 May 2018. ^ Winged Victory. Catalog - American Film Institute. Retrieved 22 May 2018. ^ Global Soundtracks: Worlds of Film Music. Mark Slobin. 13 November 2014. ^ "I Love Lucy: Season 1, Episode 2 Be a Pal". Internet Movie Database. 22 October 1951. ^ Diplomatic Courier. Catalog - American Film Institute. Retrieved 22 May 2018. ^ "Brazilian Popular Music: Caetano Veloso and the Regeneration of Tradition". Lorraine Leu. Retrieved 13 December 2015. ^ "Chocolate com pimenta: Trilha sonora". Memoria Globo. 21 March 2010. Retrieved 1 September 2014. ^ "Carmen Miranda – Beneath the Tutti Frutti Hat". BBC. Retrieved 17 July 2014. ^ "Ivete Sangalo – MTV ao Vivo". ISTOÉ Gente. 12 March 2004. ^ "Renewing Carmen Miranda". GreenGoPost. 21 March 2010. Retrieved 17 December 2013. ^ "Carmen Miranda performing in 'Sing With the Stars'". Getty Images. Retrieved 4 July 2015. Bakish, David (2007). Jimmy Durante: his show business career, with an annotated filmography and discography. Jefferson, N.C.: McFarland. ISBN 0-7864-3022-2. Brioux, Bill (2008). Truth and rumors: the reality behind TV's most famous myths. Westport, Connecticut: Praeger. ISBN 0-275-99247-0. Castro, Ruy (2005). Carmen: Uma Biografia. São Paulo: Companhia das Letras. ISBN 978-8535907605. Dennison, Stephanie; Shaw, Lisa (2004). Popular cinema in Brazil, 1930–2001. Manchester, Indiana, US: Manchester University press. ISBN 0-7190-6499-6. Hirschhorn, Clive (1981). The Hollywood musical. London: Octopus. ISBN 978-0706412802. McGowan, Chris; Pessanha, Ricardo (1997). The Brazilian sound : Samba, bossa nova and the popular music of Brazil. USA: Temple University Press. ISBN 1-56639-545-3. Parish, James Robert; Pitts, Michael R. (2003). Hollywood songsters : singers who act and actors who sing; a biographical dictionary (2nd ed.). New York, NY: Routledge. ISBN 0-415-94333-7. Ruíz, Vicki L.; Korrol, Virginia Sánchez, eds. (2005). Latina legacies : identity, biography, and community. New York: Oxford University Press. ISBN 0-19-515399-5. Sforza, John (2000). Swing it! : the Andrews Sisters story. Lexington, Kentucky: University Press of Kentucky. ISBN 0-8131-2136-1. Tompkins, Cynthia; Foster, David William, eds. (2001). Notable Twentieth-century Latin American Women: A Biographical Dictionary. Greenwood Publishing Group. ISBN 978-0313311123. Gil-Montero, Martha. Brazilian Bombshell. Dutton Adult. 1988. 978-1556111280. 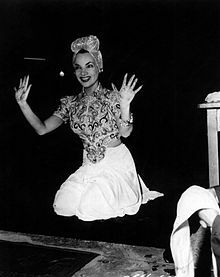 Wikimedia Commons has media related to Carmen Miranda. Museu Carmen Miranda In the city of Rio de Janeiro. Carmen Miranda on The Jimmy Durante Show – Her last performance, 1955 on YouTube At about the 24 minute mark, doing a fast dance with Durante, she falls to her knees, he helps her up, and she says she is all out of breath.